In this project (a side project of the 15. 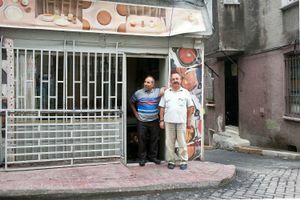 Istanbul Bienali), postcards will be used to narrate Tarlabaşı, a fast-changing neighborhood in the heart of Istanbul. 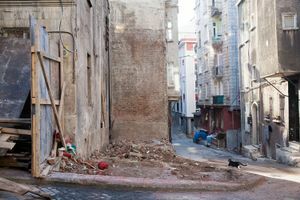 This project aims to challenge two popular images of Tarlabaşı that have been created in recent years. 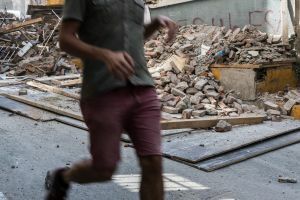 Till now, the media has broadcast a stereotypical picture made of run down buildings, marginalized people, crime, prostitution. On the other hand, the real estate investors and the public authorities have begun a glossy advertisement campaign in which Tarlabaşı looks like a fancy European neighbourhood, with a mix of slick residential blocks and shiny offices in the city center. This postcard is one out of 5 selected that will be spread around town and possibly further. 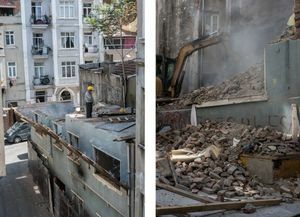 What you see in the picture is an empty space in this neighbourhood – near where I was living and working – where a building was torn down in a matter of days, while I was there. People who'd been living there had to move because investors bought the property, where they plan to build a five-floor luxury building. 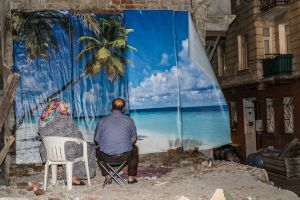 I decided to use the space of these newly exposed walls and to install a wallpaper image of the kitchiest beach scene I could find, in order to create a space – a symbol of ”paradise” – that people from the neighbourhood could sit in front of. Not showing them what they can't reach, but instead, using this space again. And it worked out: people began talking about this corner, stayed with me while I was installing it and, in the end, came with a chair of their own to sit there.